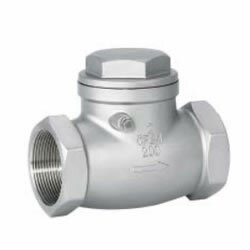 This check valve can be applied to hydraulic system, pneumatic system, pharmaceutical fittings, air brake fittings, gas fittings, refrigerant fittings, etc. Nominal pressure of this product can be PN1.6, 2.5, 4.0, 6.4Mpa. And the strength testing pressure could be PT2.4, 3.8, 6.0, 9.6MPa. 1.8, 2.8, 4.4, 7.1MPa will be available for seat testing pressure. The applicable medium for this female check valve can be H1411 W-(16-64) C water, oil, gas, H1114 W-(16-64) P nitric acid and H14 W-(16-64) R acetic acid, etc. the suitable temperature range is-40℃~180℃. Statement: this information is just for reference, for detailed information, please contact us.